Round = easy? Well, sorta. That's larger than 3/4", is metric, and a regular drill that large is a bit dicey in a panel. 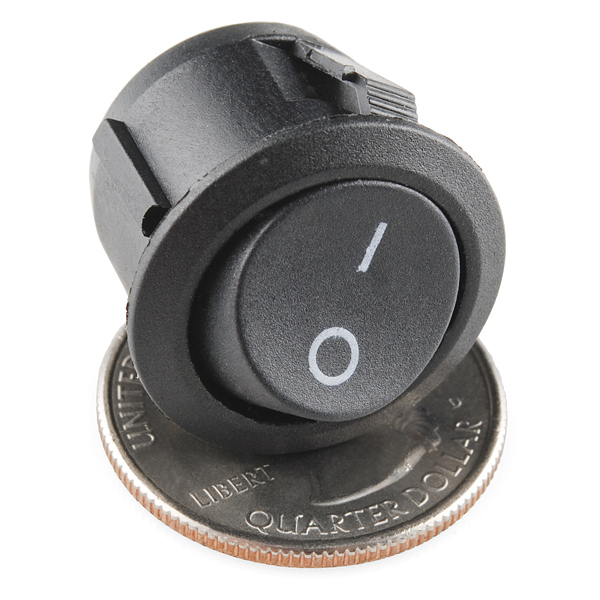 Most of us would drill it 3/4", cuss when the hole wasn't round, then file it out to ~0.79" (20 mm). To make it easy, stop by that auction site and get a set of metric step drills for about 30 bucks. Step drills are far better than standard twist drills in sheet metal and aluminum or plastic panels. In fact, imperial and metric step drills would be good products for Sparkfun to sell. Round = Easier to mount using just a drill! Any idea what the DC current/voltage ratings are? Picture shows 6A @250V, 10A @ 125V, and yes I second: round mounts easily ! 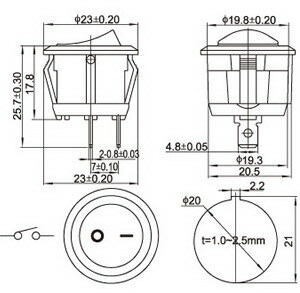 Good quality round switch, easy to install due round package and spade connectors (5mm wide ones), no soldering required. 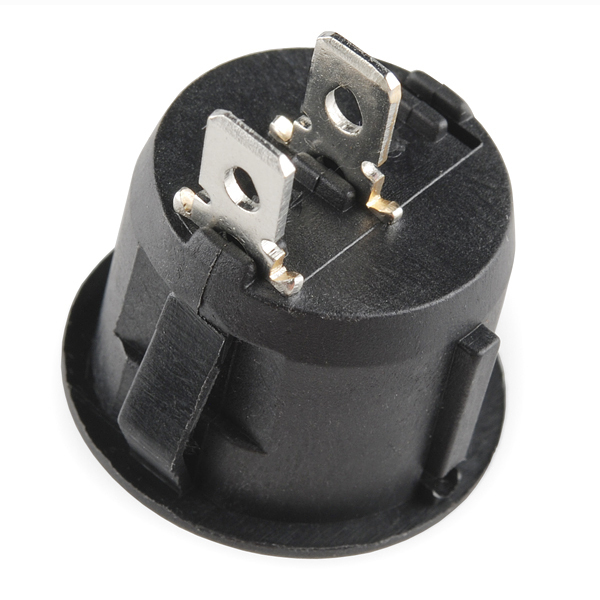 There is small notch that must be taken account during installation, but that's good to leave as it is, prevents switch spinning around in hole. Also, 6A/250VAC, not well seen from picture. A very tactile, stable, and satisfying switch I've used in several projects. However, I've never been able to install this in a 20mm hole without breaking off the bits on the side with a pair of pliers? Is there some trick I'm missing here? Sorry, I'm not familiar with any tricks. You might size up your hole slightly, though too much and you might end up with a loose fitment. Sorry I don't have any better tips. Happy hacking! 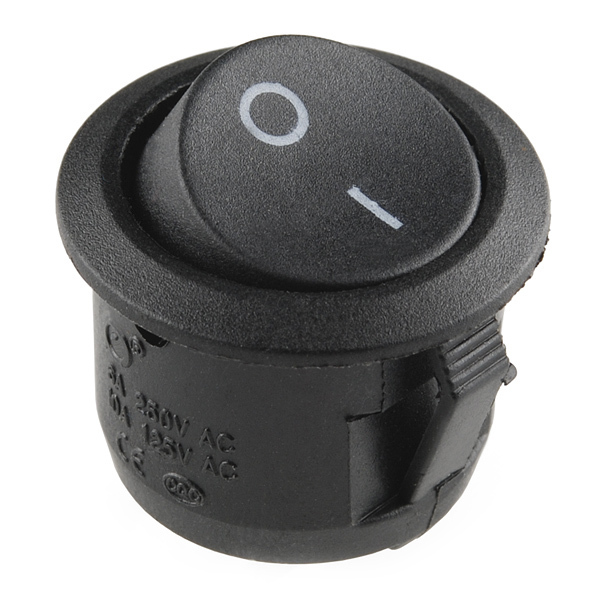 This is a great little AC rated switch - no frills. Easy to put in a box because you just drill a round hole - then cut a little notch in the side of the hole for the key (on the other side of the switch in the photo) with a little file. Be advised, this baby can be a little stiff! But all in all a great value for the price!